Remembrance Day in Canada always holds a place in my heart. I’m thankful for the people who fought for our country (and others). I’m also thankful for my family and friends who have fought for us (an other countries). 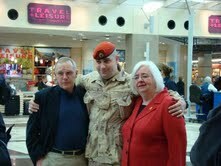 My brother’s been deployed and continues to serve in the Canadian military. He/we also have a number of friends who are in the military; leaving their families for deployment, training or education. I always take time to think about them and not only what they have done but what their whole families have gone through. Those families that stay behind while their spouse goes off still must keep moving forward. I have a love-hate relationship with this photo. The pride in my brother’s face as he stands with our parents, about to leave for the unknown amount of time. My parents who are just holding it together, even though my father looks completely devastated and my Mom just being their for her only son. Families sacrifice while their loved ones leave. So today, I will remember those in the past, in the present and in the future, thank you for serving our county. And thank you to those families as well. For veterans and those in active-duty, GoodLife Fitness is offering free access for the Month of November (1st -30th). For more information, go here. What a beautiful picture of your family. I can understand how it is a bittersweet photo for sure, but what a great shot. Great post dedicated to Veterans! What a true and noble sacrifice! I love this picture of your family and your description of how bittersweet this moment was for your family. So grateful for men and women like your brother who protect millions of us!